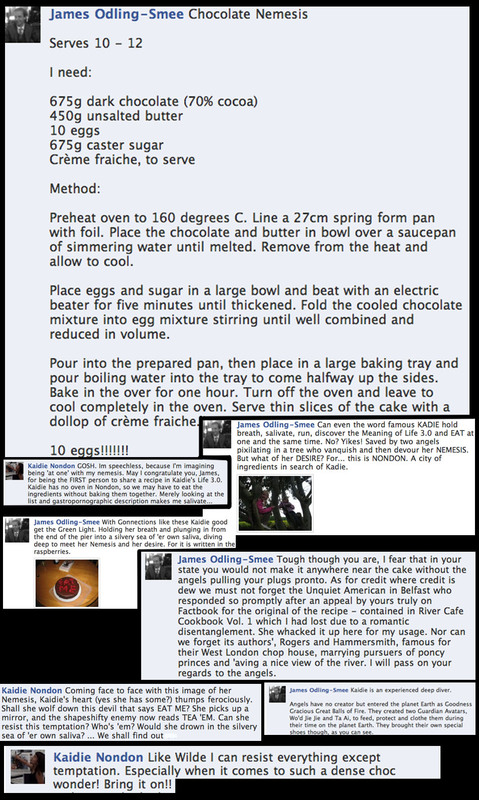 JAMES ODLING-SMEE’S GENESIS OF THE CHOCOLATE NEMESIS. Under ordinary circumstances, Kaidie can demolish any Nemesis – especially Dark Chocolate ones, and in particular those of 70% cocoa and above (yes, ones that are 85% too) – with absolutely no effort. Including, and especially big big big ones. However, under extraordinary circumstances last week, The Chocolate Nemesis (TCM) launched a most brutal attack (Perhaps Kaidie shouldn’t have departed from her Companion For The Evening? Would CFTE have helped her win the Battle?). Kaidie did not expire before her 1000-day grant, being skillfully saved by 2 Amazing Angels. Here, we learn about the genesis of the word famous James Odling-Smee‘s Formidable Chocolate Nemesis. Mister Odling-Smee is one of Kaidie’s virtual runing buddies whom she met when running in Life 2.0, specifically, the evil Facebook. Here is THE FIRST EVER CAKE AND RECIPE SHARED ON A RUNNING BLOG OF A TRANSDIMENSIONAL RUNNER. Yes it is official! This entry was posted on Tuesday, July 13th, 2010 at 14:15	and is filed under DOING IT WITH OTHERS and tagged with meaning of life, mortality, web 2.0. You can follow any responses to this entry through the RSS 2.0 feed. You can leave a response, or trackback from your own site.